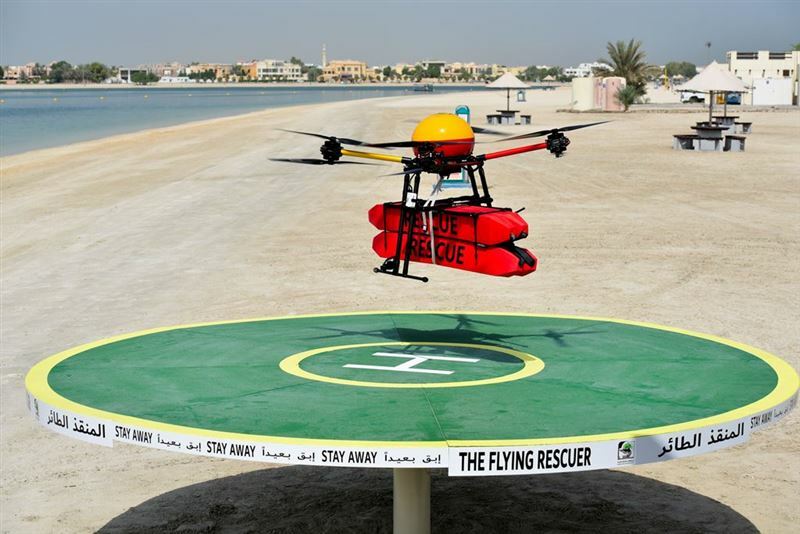 As part of its keenness to maintain the safety and security of public beach users in the emirate, the Dubai Municipality has developed "Flying Rescuer", an Unmanned Aerial Vehicle, UAV. Commenting on the announcement, Khalid Sharif Al Awadhi, CEO of Environment, Health and Safety Sector, said, "The emirate is keen to provide all safety standards for its residents and efforts are constantly being exerted in Dubai Municipality to implement practices to enhance the safety principle especially in destinations that are witnessing continuous growth in the number of visitors such as beaches. The municipality pays great attention to the development of coastal safety systems according to the latest and most advanced methods. The "Flying Rescuer" is the first of its kind in the world UAV, which is currently being used around the world designed only for individual rescue operations." In turn, Alia Al Harmoudi, Director of Environment Department, said, "The municipality has developed an excellent local UAV or drone, whose unique design is capable of responding to group or individual drowning cases. The drone can transport up to four rings of lifebuoys to the drowning incident area which can support up to eight drowning people at the same time. It can also be used with a rescue raft that automatically inflates when it touches the water instead of buoys to save several people at the same time. The Flying Rescuer gives the initial response to drowning so that the human rescuers have access to the situation, which makes the rescue operations on holidays and weekends easier." The Flying Rescuer is one of the latest innovations added to the Coastal Rescue and Safety System run by the municipality, which has achieved zero "deaths" due to drowning cases since its opening in 2016. The total number of rescue and relief cases was 2,139, of which 330 were group drowning cases or 15 percent of all rescue and relief operations at the rate of 3 to 4 people drowning at the same time.